This week we focused on the Outdoor Hour Challenge Crop Plants #1 – Clover that is at the Handbook of Nature Study website. You can do an internet search for each of these kinds of clover so you and your children will know what you are looking for during your Outdoor Hour time this week. I use Google Images. – Clover has for centuries been a most valuable forage crop; and…it has been the special partner of the bees, giving them honey for their service in carrying as pollen. – Those blossoms which are lowest, or on the outside of the head, blossom first. – All of them have upon their roots the little swellings, or nodules, which are the houses in which the beneficient bacteria grow. – If we pull up or dig out the roots of alfalfa or…clovers…we find upon the rootlets little swellings whic hare called nodules, or root tubercles. – Each nodule is a nestful of living beings so small that it would take twenty-five thousand of them end to end to reach an inch. – Even a little swelling can hold many of these minute organisms, which are called bacteria. 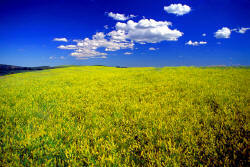 – The bacteria…are…underground partners of these plants. The clover roots give the bacteria homes and places to grow, and in return these are able to extract a very valuable chemical fertilizer from the air, and to change its form so that the clovers can absorb it. The name of these substance is nitrogen. – Clover roots, which penetrate very deeply, protect land from being washed away by…heavy rains. – Clover foliage makes a thick carpet over the surface of the soil [and] prevents evaporation and thus keeps the soil moist. 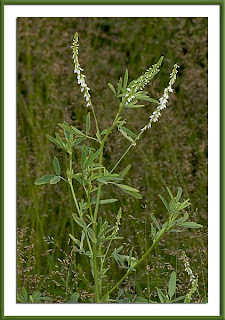 – [Sweet clover has] a perfume so sweet, so suggestive of honey…in the blossoms. It may be the species with white blossoms or the one with yellow flowers. – [It is] beneficial alike to man, bee, and soil. – [Sweet clover can grow] on soil so poor that it can only attain a height of from two to four feet; but if it…gets foothold on a generous soil, it rises majestically ten feet tall. – The blossom stalk…is at first an inch or so long, packed closely with little green buds having pointed tips. But as soon as the blossoming begins, the stalk elongates, bringing the flowers farther apart. – [White clover has] flowers [that] are all in one bunch, the tip of the stalk making the center of the clover head. Clover growing in the backyard. – The leaves are very pretty. – The white clover, in common with other clovers, has the…habit of going to sleep at night. Clover leaves fold at the middle, the three drawing near each other, looks like going to sleep. Olivia looking a clover leaf she found. – The clover head is made up of many little flowers; each one has a tubular calyx with five delicate points and a little stalk. Clover head made up of tiny little flowers. This one is in the backyard. – The outside blossoms open first; and as soon as they are open, the honey bees, which eagerly visit white clover wherever it is growing, begin at once their work of gathering nectar and carrying pollen. New clover with the outside blossoms opening first. – White-clover honey is in the opinion of many the most delicious honey made from any flowers except, perhaps, orange blossoms. So valuable is the white clover as a honey plant that apiarist often grow acres of it for their bees. We use to have a beekeeper who had several hives here. This past winter was particularly difficult for the bees, and he lost all the bees. So, this is the first year in many years that we haven’t had bees here. 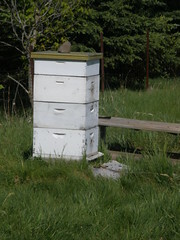 One of the beehives that was here for many years. there are no longer beehives here. One of the years, he suggested planting white clover near the bees. The clover has since spread throughout different areas of the farm – the nature trail (which is used as a pasture during the late-fall and winter), backyard, and main pasture. We did a study about bees several years ago, learning about the different types of bees, and the different stages of honey (from the bees gathering the nectar to harvesting). This was a fun hands-on lesson that had the girls pretending they were bees as they visited different activity stations (e.g., clean the hives, drink nectar). This time we went out and sat by the clover for a while to see if any bees visited the flowers. We didn’t see any in the backyard. However, later while I was mowing on the nature trail where there’s a combination of white and red clover, there were some bees visiting the red clover. We found plenty of clover so we didn’t focus on pollen during this nature study. 5. After your outdoor time, make sure to discuss with your children what interested them from their nature study this week. They may be more interested in learning about something they observed and our job as parents is to help them answer their questions. Use the Handbook of Nature Study by looking up the topic in the index or the table of contents. wondering if it was edible. Found some recipes for ways that clover can be used for eating. Since there’s an abundance of clover on the nature trail, we will pick some of that later this week and make some recipes using clover. In the mean time, there are recipes listed below that use clover. The girls picked several clover plants and leaves to draw in their nature journal and observe closer with a magnifying glass indoors. that she brought indoors to draw. We did not dig any of the clover plants up since it was so hot outside (almost 90 degrees). On a cooler day, this would be an interesting thing to do. There were many clover plants in different stages of growth in the backyard. The girls looked for ones at the early stages of growth, middle, and end. Sophia looking for clover in different stages of growth. We enjoyed some honey that was produced from the bees/hives on our farm. I read on Healthy Home Gardening that “Native Americans used whole clover plants in salads, and made a white clover leaf tea for coughs and colds. Leaves of white clover are edible, raw or cooked. The young leaves are best harvested before the plant flowers, and can be used in salads, soups etc. “They can be used as a vegetable, cooked like spinach. Flowers and seed pods have been dried, ground into a powder and used as a flour or sprinkled on cooked foods such as boiled rice. The young flowers can also be eaten raw in salads. The root can be eaten if cooked first. Clean and dip clover flowers and leaves in cold salted water. Remove and cut into pieces. In a large saucepan, sauté flowers, leaves and onions in butter. When all is softened add water, then potatoes, and season with salt and pepper. Cook gently for 20 minutes. Drain the cooking liquid and save it. Puree potato mixture and dilute with the cooking liquid, stirring constantly. Bring to a boil, the reduce heat and simmer for 3 minutes. Can sprinkle with grated cheddar cheese if desired. Make a fresh salad using lettuce and onions from the garden. Sprinkle white clover blossoms on top. White clover has many health benefits. According to the Peterson Field Guide of Eastern/Central Medicinal Plants and Herbs, American Indians used leaf tea for colds, coughs, fevers, and leukorrhea. In European folk medicine, flower tea is used for rheumatism and gout. Like red clover, white clover contains the estrogenic isoflavone genistein which has cancer-preventative properties and antioxidants. 1. Pick fresh flowers and leaves. 3. Place in a tea kettle or small pot with water. 4. Heat to almost boiling. 5. Strain into tea cup. 6. Add sugar or honey (if desired). We enjoyed learning about clover and its benefit to bees and environment. It was an added bonus to learn about its use throughout history by American Indians as well as other in folk remedies. I’m sure that when we use the blossoms in a variety of food this weekend, it will be something that we will remember for a long time! I’ve been gradually working my way through the house over the past seven months now trying to simplify and organize each room. Sometimes it doesn’t take as long as I anticipate. Other times it can be rather slow-going. This is the case with the kitchen…where it is a cupboard-by-cupboard process. Variety of rices and whole-wheat noodles. This month, I’m doing an online workshop about how to eat healthier. Part of my personal preparation and goal was to clean several of the cupboards to get rid of the food that didn’t fit into a vegetarian-vegan lifestyle as well food that was just plain…well…unhealthy. My daughters and I went shopping one Saturday and purchased items from the perimeter of the grocery store (e.g., lots of produce) as well as dried vegetables and whole grains. Once home, I pulled all the canning jars that weren’t being used. Olivia and I transferred the contents to the jars. Midway through the process, I ran out of lids (thus, the wax paper and metals bands). Jars filled and ready to be placed in the cupboard. I labeled each of the jars with the contents. This is especially helpful when it comes to the different types of flours. ﻿At this point, they look an awful lot like one another. Rye flour…amaranth flour…whole wheat flour…even white cornmeal. Not much visual difference. Wheat and some of the flours used in bread-making. What I like about this method is that I can easily find the items now. Before, when I was making homemade bread, I had to take out each of the baggies of flour that I got from the co-op and read the words I wrote on the twist-tie that noted the type of flour. It was inefficient and a waste of my time. But I simply didn’t make the time to organize my bread-making ingredients. beans, nuts, and dried fruit. One of the challenges of this kitchen is that it is small and cupboard space is rather limited. The home was built in 1890 (yes, 1890…not 1990), so the design is a bit dated. 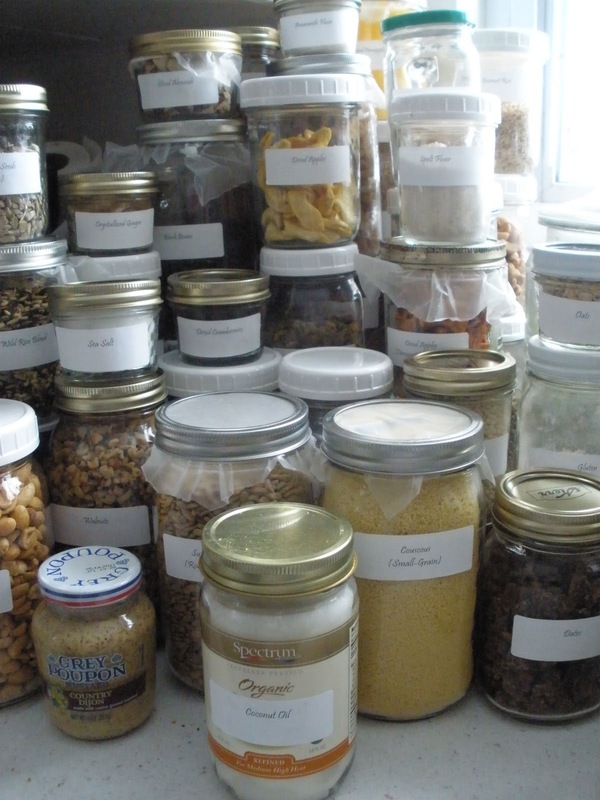 However, I have some back-up shelves in my home office which I use for all my quart-size homemade canned goods ﻿(e.g., tomato sauce, applesauce, peaches, pears, honey). In the living room, there is a floor-to-ceiling storage unit that has two shelves filled with homemade canned jams, jellies, salsas, and other items I can during the summer. Sophia, Olivia, and I are planning on doing more canning this summer when produce is plentiful and less expensive…and we can get it directly from the farmer (or grow it ourselves). Needless to say, I’ll have to make more space for additional canned goods. At least I have three months to organize and simplify other parts of the home. This week’s book for the 52 Books in 52 Weeks is Justin Morgan Had a Horse by Marguerite Henry. Ms. Henry has written a number of books about horses including the Album of Horses of which both Sophia and Olivia have a copy. It’s an excellent resource that has information and illustrations about different breeds of horses. When we did a unit study on horses a couple of years ago, I read Justin Morgan had a Horse to the girls. This book is part of Sonlight’s curriculum for Sophia, so I’m going to read it again to them. Being that the girls are older, they may hear some things they didn’t hear the first time around. The back cover summarizes this 170-page book: Joel Goss knows that Little Bub is a special colt, even though he’s a runt. And when schoolteacher Justin Morgan asks Joel to break the colt in, Joel is thrilled! Soon word about Little Bub has spread throughout the entire Northeast — this spirited colt can pull heavier loads than a pair of oxen. And run faster than thoroughbreds! The girls received some past issues of Horse and Rider from one of the parents in their 4-H club whose family has and shows horses. They have been cutting out pictures of their favorite horses and putting them aside for use in a project. I’m not sure what they have in mind…so it will be interesting to see what they create. This week, we’ll also be looking at the 4-H horse project booklets for Sophia and determining which activities she’d like to do between now and the County Fair (in July). I’m also going to look at the curriculum for Cloverbuds (a 4-H program for children who are in second grade and younger) and see if there are any horse-related project that Olivia can do. 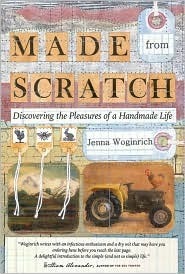 The book that I’m starting to read this week as part of 52 Books in 52 Weeks is Made from Scratch – Discovering the Pleasures of a Handmade Life by Jenna Woginrich. The description of this book on the inside cover says, “In a world of mass-produced food, factory-stitched clothing, 300-channel cable television, and computer-centric desk jobs, it’s easy to overlook the simple pleasures of eating homegrown vegetables, raising animals naturally and humanely, wearing hand-sewn clothing, or enjoying an evening of unplugged entertainment. “Inspired by her growing admiration for small farmers and her growing distaste for rampant consumerism, 26-year-old web designer Jenna Woginrich decided to take control of her life — what she ate, what she wore, and how she spent her free time. Learn a few basic country skills, she reasoned, and she would be able to produce at least some of the food and other resources she used every day. Chickens – I’d really like to have a flock of rare and endangered chickens again. Building a safe enclosure for them is the only obstacle to not having them…right now it’s cost-prohibitive. Grow Your Own Meal – The book focuses on having a vegetable garden. I’m looking forward to expanding the vegetable and fruit gardens this spring/summer. Beekeeping – I tried this many years ago and kept getting stung. Now, a beekeeper keeps hives at the farm and I get some honey each year from the bees in exchange for having the hives here. The Country Kitchen – The book has recipes and instructions for making homemade bread and butter – both of which I’ve done. I enjoy making bread and am always looking for good recipes. Have used a butter churn when my daughters were younger and we participated in an early-childhood program at the local Waldorf school. Old Stuff – The author talks about visiting antique shops and acquiring antiques. I use to do this many years ago as a way to furnish the 1890 farm home. It’s nice to have antiques that are from around the same time period that the house was first built. 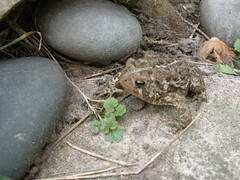 Outside the Farm – The book suggests several ways to connect with others. Some ideas are farm-related, and others are not. DIY Wardrobe – The author shares her experience with making her own clothes. Angora Rabbits – Portable Livestock – This is more of Sophia’s goal – to have rabbits and something that I would probably end up taking care of a good percentage of the time. Working House Dogs – Although I wouldn’t be able to have a team of dogs and sled here, going on a dog-sled ride would be something I would really enjoy doing some day. Want More? – There are some good recipes to try in this section. Homemade Mountain Music – I don’t have a strong interest in playing the mountain dulcimer, fiddle, banjo, or mandolin as was mentioned in Made from Scratch. However, I would like to get back to playing the piano on a regular basis and challenge myself to continue to learn new songs. I have a strong feeling too that I’m going to have to learn how to play the harp and guitar when Sophia and Olivia start playing their instruments of choice next year and the following year respectively. Made from Scratch has so many great ideas that are worth exploring, especially as prices increase for food, gas, and other necessities. It gives encouragement and direction to those wanting to be more self-sufficient and to lead a more sustainable life. Sometimes, in the middle week, it’s nice to get a little inspiration to carry oneself through the rest of the week. I thought it would be good to have a weekly post where everyone can share what they are working on or have recently completed for their family or themselves; or given as a gift. This week, I made Tomato-Herb Focaccia. The recipe is from the February/March 2011 issue of Taste of Home magazine. Taste of Home is a great magazine because the majority of recipes have ingredients that typically would be in your kitchen. There are not a lot of unusual or speciality ingredients which makes it easy when you want to try a new recipe. Note about the picture: The cheese isn’t as browned as I would prefer it, but Olivia (who is 8 years old) doesn’t like the cheese to be too dark otherwise she thinks it is “burnt cheese” and won’t eat it. The left side has cheese and the right side doesn’t so Sophia can eat it (she has a dairy allergy). In a large bowl, dissolve yeast in warm water. add 1 tablespoon oil, salt, sugar, garlic powder, herbs, pepper, and 1 1/2 cups flour. Beat until smooth. Stir in enough remaining flour to form a soft dough (dough will be sticky). Turn onto a floured surface; knead until smooth and elastic, about 6-8 minutes. Place in a greased bowl, turning once to grease the top. Cover and let rise in a warm plce until doubled, about 1 hour. Punch dough down. Cover and let rest for ten minutes. Shape into a 13″ x 9″ rectangle; place on a greased baking sheet. Cover and let rise until doubled, about 30 minutes. With fingertips, make several dimples over top of dough. Brush dough with remaining oil; arrange tomatoes over the top. Sprinkle with cheeses. Bake at 400 degrees for 20-25 minutes or until golden brown. Remove to a wire rack. I made some changes to the recipe since I didn’t have all the ingredients. Instead of garlic powder, I used garlic flakes. Instead of the oregano, thyme, rosemary, and basil I used a pizza seasoning with has a variety of herbs and spices. Half of the focaccia is dairy-free – it doesn’t have the mozzarella or Parmesan cheeses. The other half does have the cheeses. In this way, everyone can eat the bread. I served it with a homemade version of Papa John’s pizza sauce. Again, I used a base recipe and then modified it based on what I had on hand as well as the taste. Everyone liked the bread. The only suggestion was that Sophia said the tomatoes could be left off the next time it is made. I’d agree…unless they are ones we grow here during the summer that are much more flavorful than the ones in the store. Using fresh basil, rosemary, and tomatoes from the garden would give this bread a completely different flavor. 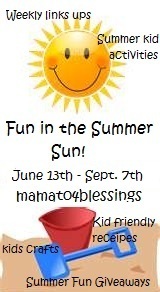 Something to look forward to…having the vegetable, fruit, and herb gardens again this summer! – anything creative…it’s up to you! Share your Mid-Week Motivation with the world! Or…with others who will read this post. Put an image onto your blog, and write a little bit. When you’re all finished, link back to this post (simply copy the address at the top of your screen and paste it into your blog post). Come back here to this post, and add your link to the photo list below! Note: If you’d like to include the image of the purple and blue window star to show you’re participating in Mid-Week Motivation, simply right-click on the image on the side of the blog and save the picture to your computer. You can insert it right into your posting. 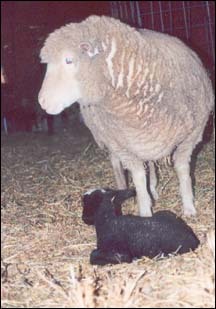 It seemed like once Oreo was born, his ewe-mother (“Woolite”)﻿ allowed me to help her care for her newborn lamb. It was critical that she accepted my help since the nights were well below zero. Keeping the sheep – “Dacron” (the ram) and Woolite – along with Oreo in the barn was the safest thing to do. The trio learned very quickly that I was the food source (hay, water, and grain) and the one who made sure they were warm (with a heat lamp and lots of straw). Once the weather was warm enough again (above zero) and Oreo was a few days older, the sheep went outdoors again. This trio – plus many who came after them – provided many hours of enjoyment not only to me but to family, friends, and others who visited the farm. In looking at past pictures I had scanned and uploaded to my computer many years ago, I came across a few wonderful surprises: pictures of my parents, niece, and nephew who participated in one of the Grandparent-Grandchild camps I coordinated here at the farm. I forgot I had these pictures, and, in finding them, they brought back memories of some very happy times. I remember having up to about 50 chickens wandering around the yard and pasture – finding bugs and grass to eat; laying eggs; and taking dust baths in the dirt. A mother hen watches and protects her chicks. 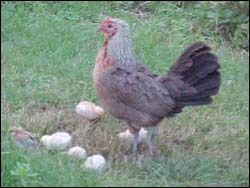 Some of my favorite memories are when a couple of the more “broody hens” would sit on some eggs for quite a long period of time. Eventually, a bunch of little chicks would hatch, and then the mother hen would have a new job: teaching the little ones where to find food and how to stay safe on the farm. on one of the Grandparent-Grandchild Days at Harvest Moon. As I looked at through some of the (many) pictures taken while I offered camp programs (some just for youth, others for grandparents with grandchildren), I feel incredibly blessed to have had the opportunity to work with motivated and positive teenage camp counselors who wanted to make a difference in the lives of children. I am equally fortunate to have had the opportunity to work alongside talented artists who inspired children and teens to explore the arts – visual, dance, music, and theater. The talent that was shared with youth – who would now be in high school or college, or be college graduates – was impressive. I’m hoping that children and teens who were part of the camp program look back and have some good memories of their time at Harvest Moon. 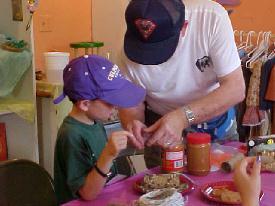 Two generations working together to make a birdfeeder. 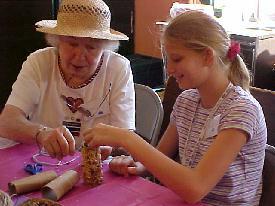 What was nice for me to see when I was looking at pictures from the Grandparent-Grandchild camp were of seniors working and learning with youth – both generations were having fun and learning together. 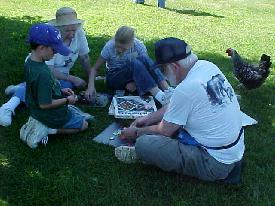 One of the activities that the grandparent-grandchild teams did was to learn about birds and how to feed them. I found two pictures – one of my niece with my mom; and one of my nephew with my dad – working on a project together. They were creating simple birdfeeders in which they spread peanut butter on a cardboard tube and then rolled it in birdseed. Working together on a birdfeeder. These feeders and other ones were sent home with the participants so they could put them in their trees and watch the birds eat. A simple pleasure – feeding and watching the birds – but one that my dad instilled in me as a child. It’s one that still lives on today.